When you come to Summit County on vacation, park the car and take the free bus. It's easy for skiers, shoppers, and for apres-ski and dinner transportation in the evening. This free service is offered year-round and is available to most ski areas, shopping centers, medical centers and some residential areas in the County. 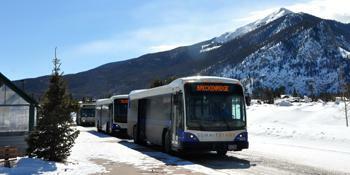 See All Shuttles & Free Bus Service items in Summit County, CO.